WTF KFC ← You Want Me To Wear What? I can think of only one situation in which this present would be an appropriate gift. If you know a man who is related to, or a fan of, Colonel Sanders. 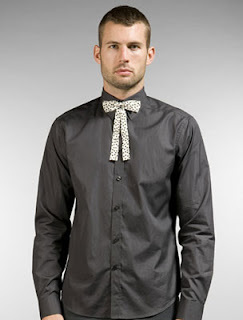 Of course, that’s a very, very small niche, so I guess the makers of this tie expect other people to buy it. Which is absurd, because seriously, when is this an appropriate accessory? When has anyone, other than the Colonel, ever looked at their shirt and thought, “What I’m missing is a Western Tie”? Even the model looks unhappy to be wearing it, and he’s getting paid.